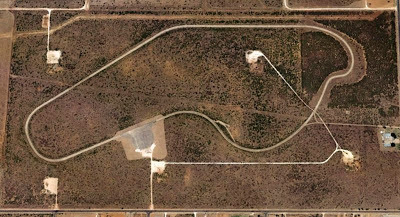 Aerial view of Rattlesnake Raceway, located just outside Midland, Texas. Some of the fastest race cars of the 60's came out of a little shop in Midland, Texas. Jim Hall and his clever Chaparral cars re-wrote the book on race car aerodynamics. To develop his revolutionary cars, Hall funded the construction of his own race track. (Sound familiar?) Located in the barren desert picturesque plains of West Texas, Rattlesnake Raceway was the home stomping grounds of some of the most radical race cars of the era. Set on a plot of land with three fully functioning pumpjacks, it's amazing to think of advanced cars like the 2D and 2J "sucker car" lapping its corners. According to Car and Driver in 1966, the fastest lap of the 1.96 mile track was a blistering 1:04.8 with cars reaching 160 mph on the fastest sections. But the track's high speed corners and narrow width was a dangerous combination. After just two events and one fatal accident, Rattlesnake Raceway closed to the public.